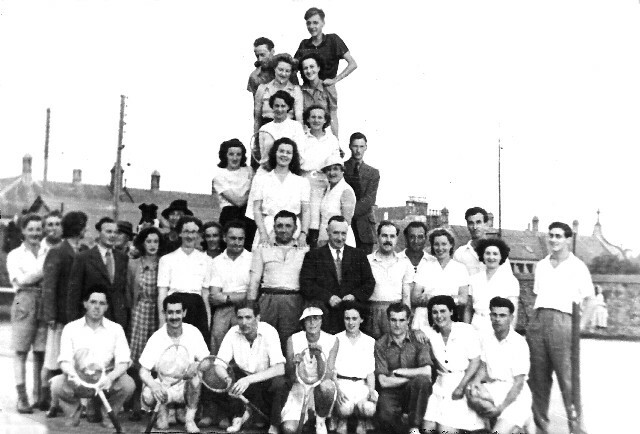 Members of Invergordon Tennis Club with Polish soldiers: 1945 - 46. Second from right in the front is Nita Munro/Macgregor, and 4th from right is Alice Macleod/Wilson. Hi Jessie and Lilian, isn't the 4th. bottom right Netta Macwilliams and 2nd. left Jock Forsythe from Saltburn who worked in Slater's bakery? Lady in white peaked hat 1st on right bottom row of "pyramid" is Mrs. Austin. I seem to remember that she and her husband did a lot for the club. I could give you the names of most of the people in this group. My sister and I are both in it. There are eight Polish soldiers in it. Mr. & Mrs Austin are there, Jock Forsyth and his wife, Mr. & Mrs Macfarlane who taught at Invergordon Academy. Alice Wilson is not there, nor is Nita Macgregor. Go ahead and name them Irene. I have no trouble picking out Macfarlane (Lofty) but not his wife (Titch). Top Left: Polish soldier, Willie Bisset. Next row: ?, Millie (or Margaret) Reid. Next row: Evelyn Urquhart, Mrs Macfarlane. Next row: Barry Macleod, Winnie Maclennan, Mrs Austin, male visitor. Next row: two servicemen, ?, Polish soldier, ?, Margaret Tuach in checked dress, behind her with dog is Mrs Macmillan (Cromlet), Margaret Ogilvie, Mrs Forsyth, two Polish soldiers, Mr Austin, Charlie Wilson, Polish soldier, Agnes Bryce, Wilma Grant. Behind these two are Mr Macfarlane, Joe Moss (visitor). Front row: Serviceman, Jock Forsyth, Jeff (forget surname), Mrs Skraba (spelling?, wife of Polish soldier), Netta Macwilliam, Joe (Polish soldier), Irene Grant, Polish soldier. All these read from left to right. Jeff`s surname is Walker - I remembered after sending my message. He was in the Navy and married Pat McCaw, whose father was stationed in Invergordon with the RAF. I think the polish soldier in the second row far left is my father, Maksymillian (Max) Bronny.